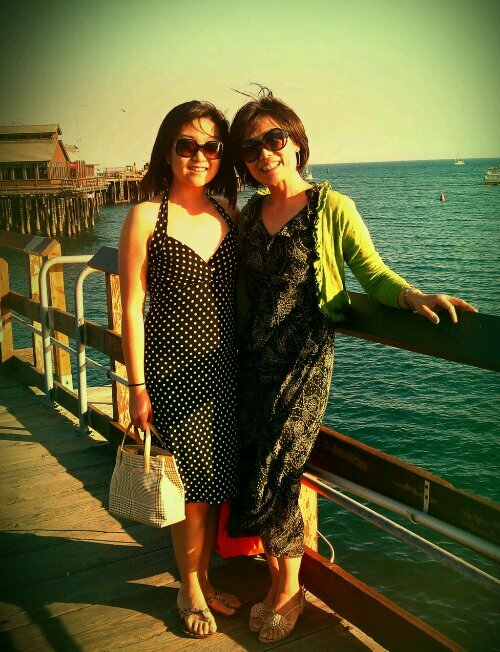 Last weekend I was itching to go on a mini adventure, so I grabbed my mom and went on a day trip to Santa Barbara. We went pretty much without an agenda and decided to see where the wind would take us. It was a gorgeous day to be out. The sun was brightly shining and the sky was so clear and blue. 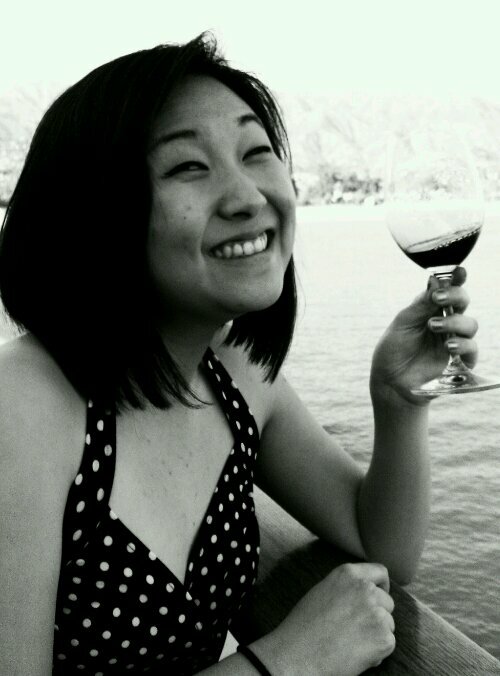 We were taking a stroll along Sterns Wharf when we saw a big banner for wine tasting, and of course that got me really excited. 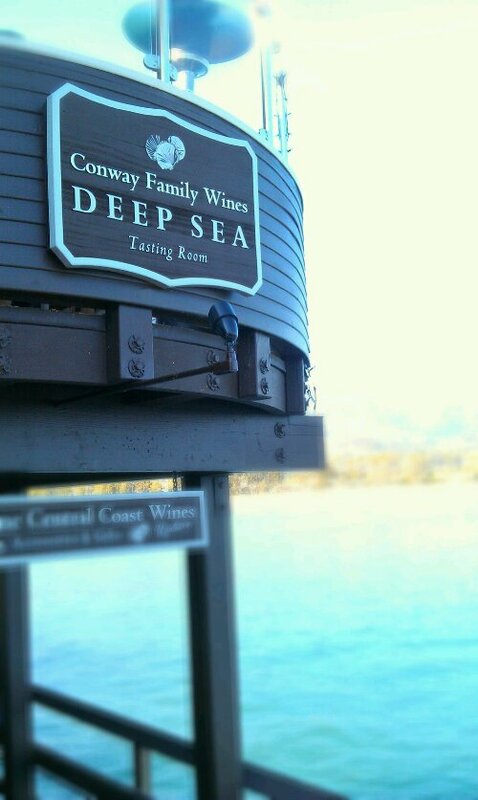 A closer look revealed the “Deep Sea Tasting Room” right on the pier! With a name like that how could you say no? We decided to check it out and that turned out to be a great decision. 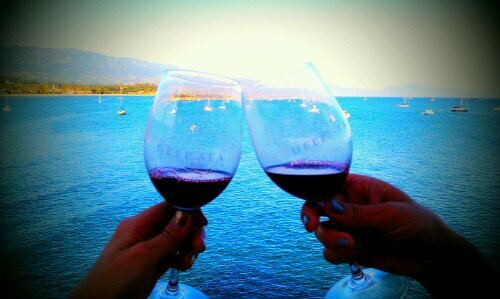 The wines were pretty good, but it was really the breathtaking view that made all the difference. The tasting room is on an elevated level which makes it feel like you’re on the upper deck of a cruise ship (all without the motion sickness and wobblyness of a real ship of course!). At $10 for 6 tastings this experience is a steal! Their award winning 2008 Deep Sea Chardonnay and 2008 Rancho Arroyo Grande Zinfandel were my personal favorites. 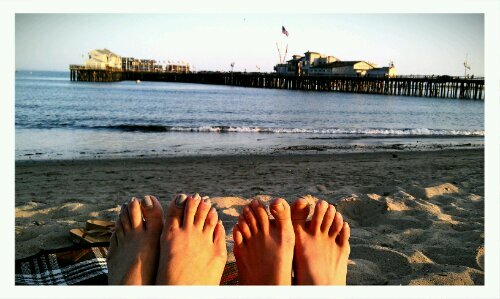 We spent the rest of the day walking around then watching the sunset. 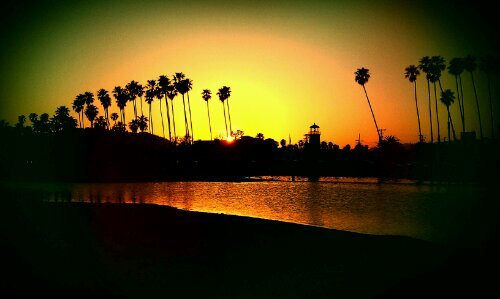 It was a lovely day and I wish I could do it all over again! 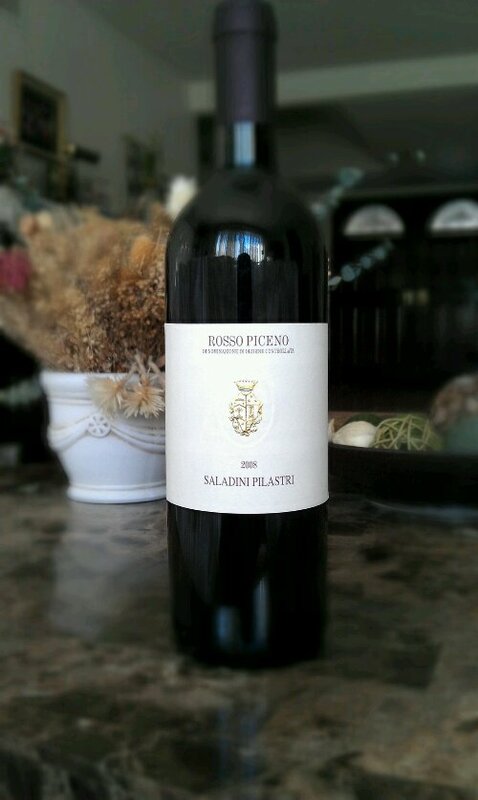 I was looking for a nice Italian wine when I came across the Saladini Pilastri Rosso Piceno 2008 from Marche, Italy. You might look at the long exotic-sounding name and think “Wow this must be a fancy schmancy expensive wine”. Except it wasn’t. For $8.99 this wine is a steal! Rosso Piceno is a red wine blend made from 70% Sangiovese and 30% Montepulciano, both which are the two most harvested native grape varieties in Italy. This particular one also happens to be made from organically grown grapes! So when I first opened this bottle of wine and tasted it, I was underwhelmed by the flatness and lack of flavor. However when I let the wine breathe (by pouring it through a nice Vinturi aerator my mother bought for me), the flavors seem to come alive and I was able to taste things that were masked before! The change was pretty astonishing and I was pleasantly surprised what a difference aerating makes on this one. 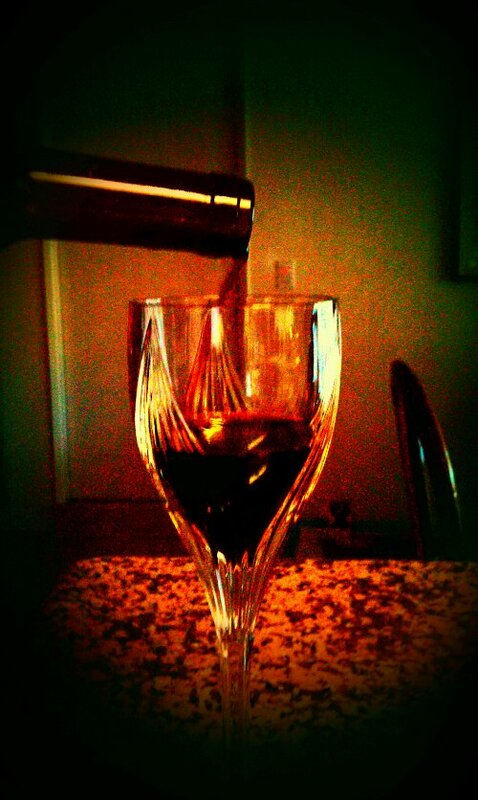 The wine starts out quite dry, and as mentioned before, letting it breathe is extremely crucial! Post-aeration this Rosso Piceno blossomed into a fruity, lively, and very enjoyable red. The flavor is fresh and bursts with personality, and it leaves a nice, light aftertaste after it has left your mouth. The lightness combined with the mesmerizing flavors really make it an experience that is flirtatious and pleasing to the senses. 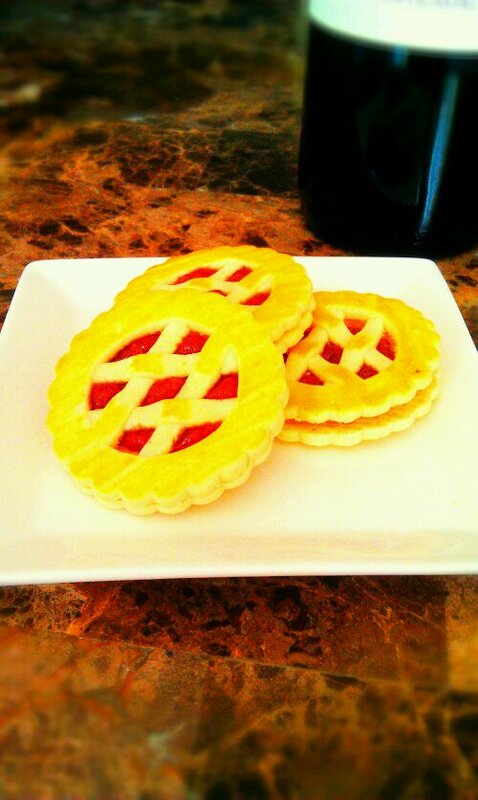 I enjoyed a glass of this wine with some Pepperidge Farm jam cookies which proved to be a pairing that is truly divine. Yum! Can you say no? I can't. My parents have received quite a few bottles of wine as gifts, but since they rarely drink alcohol many of these have been sitting around for years and years. A few days ago I realized that some of them must now be magnificently cellared reds and decided to go exploring in their alcohol cabinet. 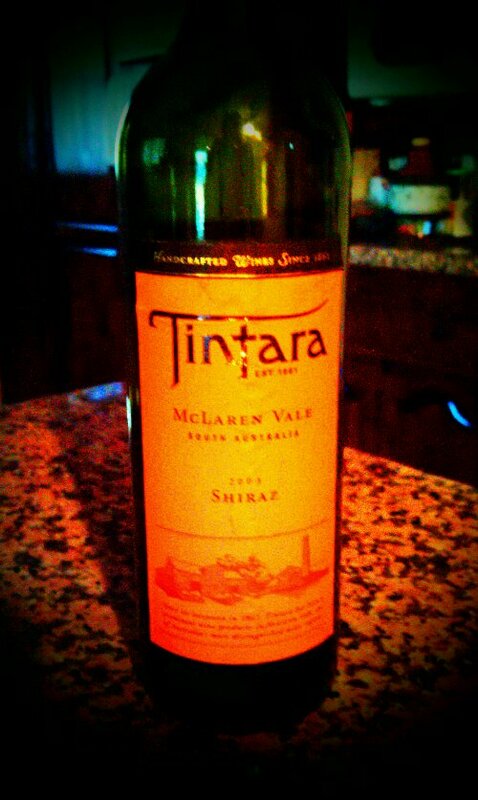 The one I decided to pick was the Tintara 2003 Shiraz of McLaren Vale. McLaren Vale is a wine region in South Australia that is well known for their Shiraz. According to Wikipedia, McLaren Vale boasts 3,218 hectares of Shiraz vines and their wines are know for their “ripeness, elegance, structure, power and complexity”. After that I knew I was getting myself in a pretty awesome situation. So now the wine. This is a full-bodied wine with an alcohol content of 14.5%. I have never tasted anything quite like this in my life. The first thing I noticed is the dryness. You can taste the bold accents of pepper and oak, which is a result of the 18 months that it spent maturing in American and French oak. There is no hint of sweetness and the flavor is POWERFUL. The aroma is slighty fruity but the taste is less so. I had to take some time to come back to reality, because this wine left me completely speechess! In other words, it was love at first taste. Unfortunately I do not know what the 2003 costs or if it is still available for purchase. However the 2007 seems to cost around ~$15 so I would definitely be interested to see what a younger Tintara Shiraz tastes like. However if you happen to get your hands on one of these gems, you won’t regret the opportunity to be seduced by this magnificent Shiraz! An impromptu wine tasting trip is the perfect way to spend a long weekend, and that is exactly what I decided to do on President’s Day. Temecula is about a two hour trek from where I live, and most of the tastings are around $10 on average. While doing my research I came upon the Falkner Winery website, and they offer 4 free tastings for two if you sign up for their newsletter! 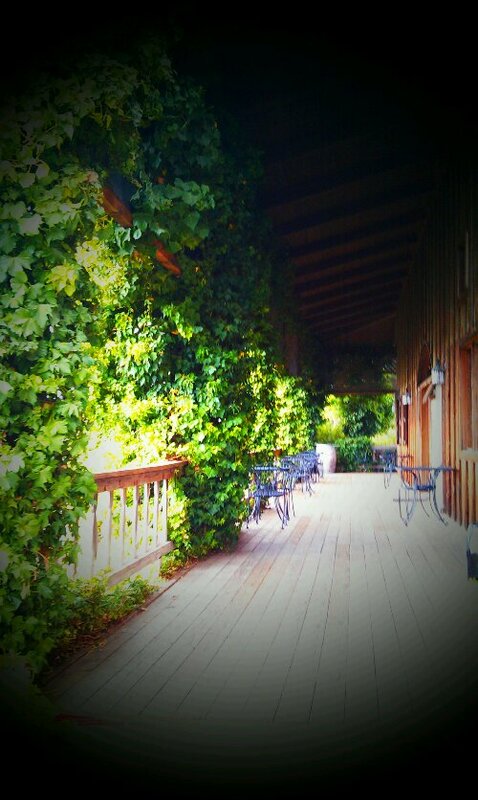 Yelp reviews also said that the place is beautiful and the wines are amazing, which made the decision quite easy. 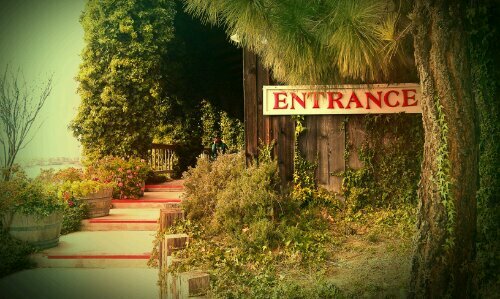 Upon arrival I was pleasantly surprised by the inviting appearance of the entrance. Something about the warm sunshine embracing the ivy covered columns was absolutely breathtaking. Unfortunately most of the vineyards were empty since it is winter and all the grapes were already harvested, but I can only imagine how beautiful the rest of the view would be around fall. I had a wonderful time tasting their wines, which are all excellent. My two favorites were the 2006 Amante Super Tuscan and the “Hot Lips”. The 2006 Amante Super Tuscan is a medium-bodied red wine blend of 60% Sangiovese with 15% Merlot, 10% Cabernet Sauvignon, and 15% Cabernet Franc. The Hot Lips is a Falkner special mulled wine which was served nice and warm. Delicious! 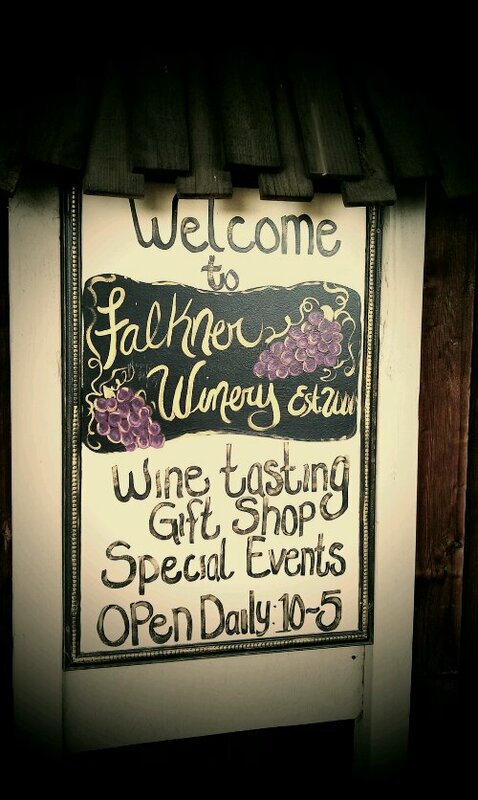 So if you find yourself bored and in need of some wine, I would definitely recommend taking a trip out to Temecula to Falkner Winery. You wont regret it! 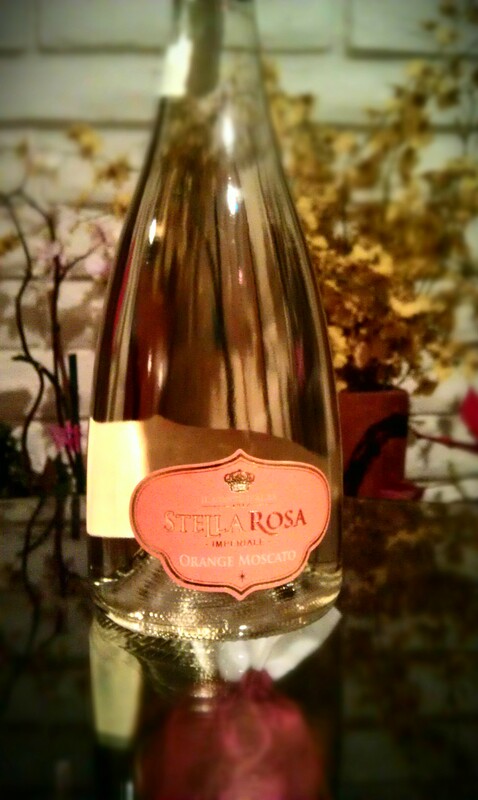 I am not usually a fan of sweet alcoholic drinks, but the Stella Rosa Orange Moscato has earned a special place in my heart. 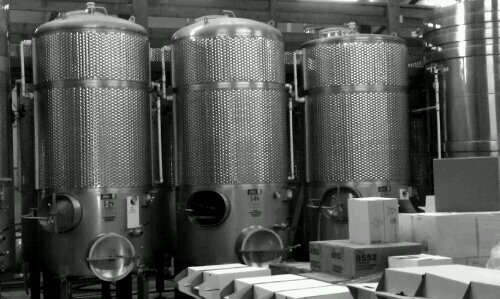 A few weeks ago I visited the San Antonio Winery, located in the heart of Los Angeles, with a couple of friends. 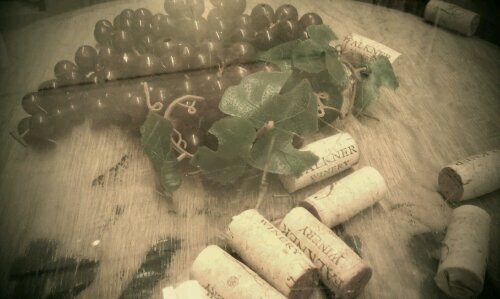 We went on the tour and afterwards they gave us free wine tastings! Usually they only give samples of 3 wines from a select menu, but the nice man who was helping us out gave us several additional samples which were off the menu, one of which was the Stella Rosa Orange Moscato. This fruity, sparkling wine is a product of Italy and is made from Muscat grapes, which are harvested around the world and known for having a sweet, floral aroma. The alcohol content is a very low 6%, which explains why I can barely taste the alcohol and only deliciousness! One unique characteristic is the slightly thicker consistency which vaguely reminded me of honey. The combination of the light carbonation and the fruity, orange flavors make for a wonderful celebration drink. Today my family and I were celebrating my sister’s visit from college, and the Stella Rosa Orange Moscato was the perfect choice for a festive evening! We also enjoyed the sparkling wine with some Sprinkles cupcakes, which were a truly delightful, drool-worthy combo. 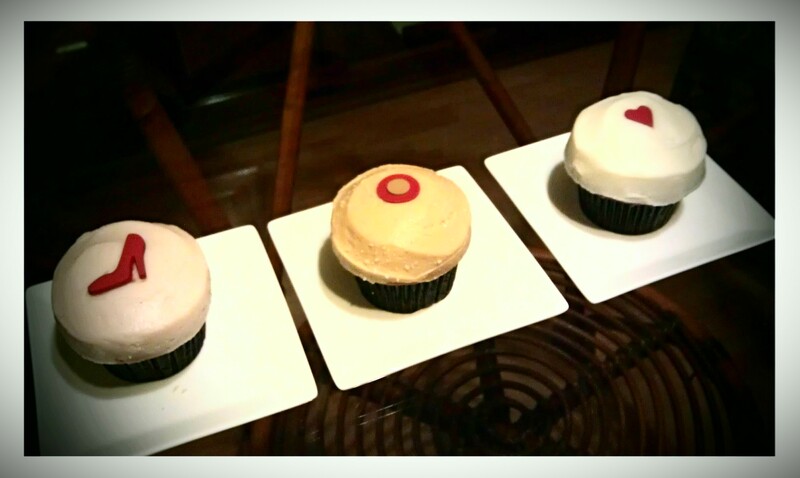 Strawberry, Salted Carmel, and Red Velvet Cupcakes from Sprinkles! So next time you have a special occasion to celebrate, you might want to pick up a few of these bottles. They are around $15 each, which is very reasonable for what you’re getting. 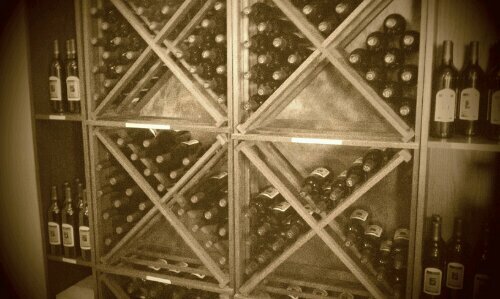 If you aren’t near the San Antonio Winery you can check out your nearest location at stellarosawines.com. Enjoy! I was told by a fellow blogger that the Pinot Noir from Central Otago, New Zealand is amazing and I immediately started searching to see if I could get my hands on a bottle. I must have looked like a crazy person. 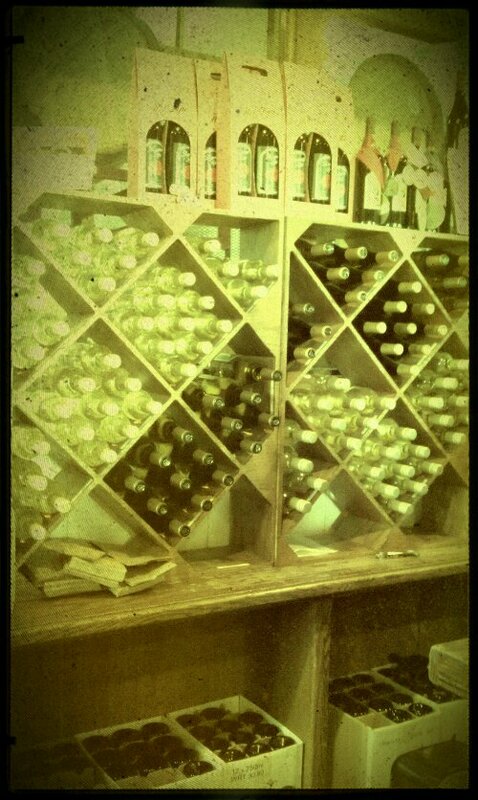 Or a dedicated wine snob (awesome!). Thankfully they still had some in stock. As I sighed a big sigh of relief I picked up a few and joyfully bounded over to the cashier to pay a very modest $10.99 apiece. So to the important part: If I had to sum up the taste in one word, I would say elegant, because of the very clean taste. However that is DEFINITELY not to be confused with bland! This Pinot Noir is very unique, and you can taste the fruit but it isn’t exactly “fruity”. It is almost a tiny bit salty but leaves your tongue before your brain can really process all the wonderful flavors that are swimming around on your palate. It will leave you wanting more and even after many sips I was left puzzled, yet very intrigued. So I am a pretty indecisive person when it comes to purchasing pretty much anything, because I like to think about every aspect of my buy. Despite my calm exterior, as I peruse the aisles I’m asking myself: Is this exactly what I want? Is this a reasonable price for what I’m getting? Will I be sad if I were to leave it behind and later think “why didn’t I just buy it???”? Of course the same process also applies to shopping for wine. 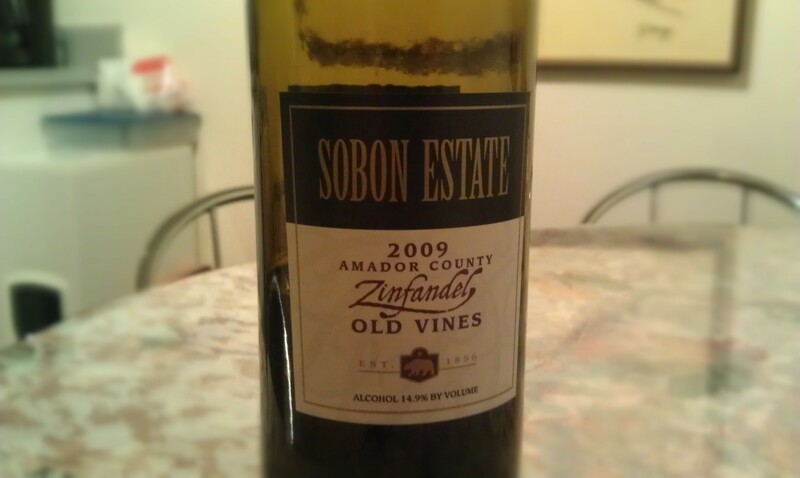 The Sobon Estate 2009 Zinfandel was recommended to me by one of the employees in the store after I told him exactly what I was looking for: a red wine with a deep flavor, fruity aroma, and a smooth finish. This wine is from Amador County, and a quick google search revealed that Amador County is renowned for its Zinfandel. Some of the vines are more than 125 years old, and their Zinfandel vineyards are believed to be one of the oldest in America! The wine itself is truly amazing. 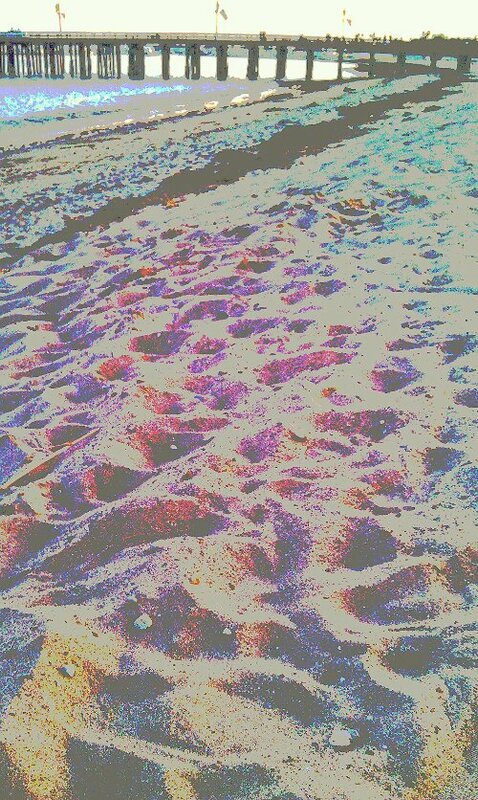 The first thing I noticed is that the smell is mesmerizing. Its not just fruity (fruity makes me think light and simple), but has a complex, almost musky smell to it. The flavor is bold, and its very clear that this wine come from no ordinary grapes. This is really a taste of history! The alcohol content is 14.9%, which is higher than the normal 12%, but the bite from the alcohol is well hidden by the richness of the wine. The bottle also has a screw cap, which is wonderful for those of us with lower tolerances (you guessed it! its me) and will need quite some time to see the bottom of the bottle. Currently I am blissfully sporting the finest glow, thanks to this wonderful Zinfandel! 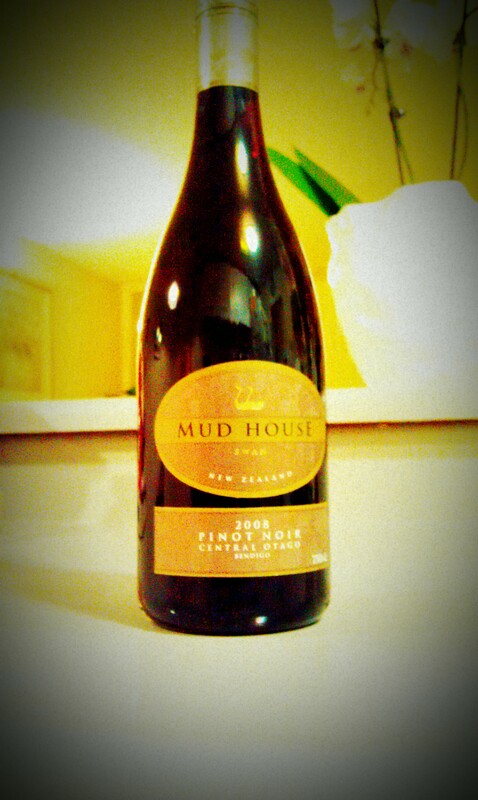 For $12.99 this wine has been worth every penny. Thank you for this amazing find, Total Wine!